This is a Textile. It was manufactured by NUNO Corporation. It is dated 2009 and we acquired it in 2009. Its medium is silk (raw silk and kibiso) and polyurethane and its technique is plain weave with supplementary weft that is cut. It is a part of the Textiles department. Kibiso Window is part of a series made from kibiso and raw silk by the Japanese textile company NUNO. The combination of these two materials reveals a very rich texture, structure, and surface design. Kibiso, an industrial waste product, is the protective outer layer of the silk cocoon that is “wiped off” and discarded in order to reach the finer silk fiber underneath. Consisting of sericin and other amino acids that ultimately help to protect the silkworm, kibiso has been used by other industries in such products as foods and cosmetics. Kibiso Window is one of the results of NUNO’s experimentation with upcycling kibiso—using the waste product to make something of greater value, such as textiles that filter UV rays and natural moisture. These qualities make the textiles in the series eco-friendly and sustainable. 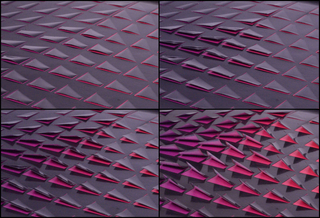 NUNO was founded in 1984 and continues to create some of the most technologically innovative and beautiful contemporary textiles anywhere in the world. In their effort to explore other uses for kibiso, NUNO also created an important social network for retired silk weavers who are now responsible for hand-weaving the fabrics in Tsuruoka, Yamagata Prefecture. Many of the workers are women who have spent their whole lives working with silkworms and whose knowledge of silk manufacturing is invaluable. Because the sericin is very gelatinous and binds like glue, it is impossible to use the 2000-denier kibiso fibers in a mechanized power loom. Nor can the fibers be machine spun into fine threads. Instead, yarns must be sorted and eventually split by hand to a manageable 200-denier slub yarn that can then be machine loomed. NUNO is particularly proud that they have simultaneously kept the elder weaving community actively involved in the local industry while making extraordinary textiles out of waste silk. 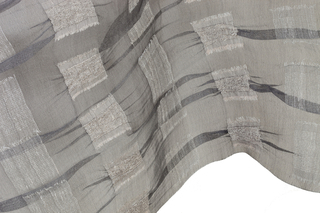 The museum holds a collection of NUNO textiles that are as varied in technique as they are in material. The proposed acquisition, part of a selection from the Kibiso series, would add further variety to the museum’s NUNO holdings and would also enhance our growing collection of eco-friendly and sustainable textiles. This object was donated by NUNO Corporation. It is credited Gift of NUNO. 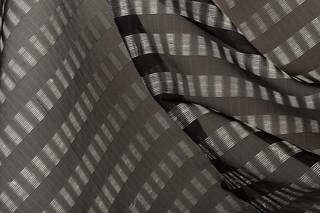 dobby loom woven 100% silk (raw silk and kibiso). 100% silk (raw silk and kibiso).